Gasification of solid waste generates inherently less SOx, NOx and particulate in the conversion of municipal solid waste (MSW), biomass, and other solid waste than does incineration. As shown in the graphic below (left) air emissions from gasification of solid waste to energy are far less harmful to the environment than landfill of the same amount of organic material. Landfills produce the potent greenhouse gas methane, and release it into the atmosphere where it is some 25 times more effective than carbon dioxide in converting sunlight into thermal energy that is retained in the atmosphere. Gasification of municipal solid waste reduces the amount of these materials going to landfill by some 80 to 90 percent. MSW gasifiers can be designed for multi-fuel applications so they can operate on a wide variety of solid wastes. 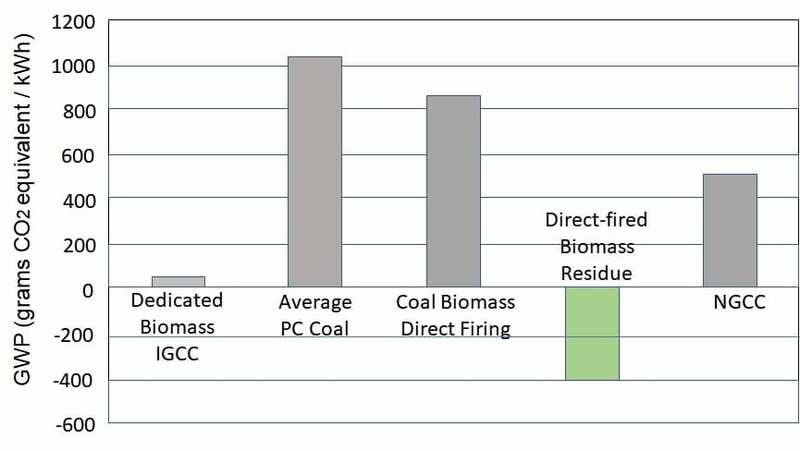 The graphic below right compares the greenhouse gas equivalent emissions for generation of power using natural gas fired combine cycle (NGCC), pulverized coal (PC) coal biomass co-firing, and dedicated biomass combined cycle, as compared to direct thermal conversion of biomass from municipal solid waste (MSW). Note that use of biomass from MSW as a fuel avoids the generation of methane and other GHG that would have been emitted into the atmosphere from anaerobic decomposition of this biomass, were it placed in a landfill. For more information on relative environmental impacts thermal energy production, please see the comparative emissions paper accessed under the Library menu.